Be Adventurous, Bundle Up, Get Outside and Go Ice Fishing! No need to stay inside during the long winter months waiting for the sun to come out dreaming about open water and summer fun. Be adventurous, bundle up, get outside and try fishing in a whole new way--through the ice! Ice fishing action can be fast and furious when winter seals the lakes under ice. Best of all, there are no mosquitoes or flies to "bug" you. Imagine this. You bundle up and walk out onto a frozen lake on a clear and crisp winter day with your sled full of fishing gear and the fishing license in your pocket. Once you find the perfect fishing spot, you drill a large hole completely through the ice until you can see open water. Then, you get out the ice chisel to widen your hole. Now, you unpack your sled and find your special lures, jigging rods or tip-ups to catch the fish. You will probably want to get out your portable seat to sit on so that you can look down the hole to see what's happening. Then, you grab the skimmer to keep the hole clear of the ice and slush that forms during the day. Once your line is set, you'll need to keep a close eye on it or watch for the flag on the tip-up to see if you've caught a fish. When your hands get cold, you grab for the thermos of hot chocolate you brought along, mmmm, just what you need to warm up. You end up eating fish for lunch out on the ice, cooked on the small stove you brought along. What a great day of fishing! Believe it or not, winter fishing makes up a good percentage of fish caught during the year. People enjoy it for the solitude of being out on a frozen lake or river and the challenge of the sport. Others like the friendship and good times found in an ice shanty town atmosphere with friends and family. Why not try ice fishing and open your senses to an exciting winter event. You must carry your license with you when you're fishin', summer or winter. Be sure to get a copy of the current State Fishing Regulations to find out about restrictions, special regulations, new changes and general statewide regulations. It is your best guide to staying within the law and having the most fun out on the ice! Look below to find information to help you get ready for your ice fishing adventure. 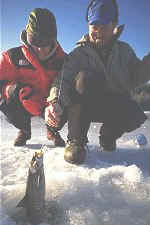 The object of choosing clothes for ice fishing is to dress to stay warm in any type of weather. The old saying goes "You can always peel off layers if you're too hot, but you can't add them if you don't have them." This means dress in layers, and lots of them! This is the same type of clothing you'd wear to a late season Montana Grizzly game in Missoula. Here are some of the basics for any winter sport. Start with the layer closest to the skin. This is where you want to be sure to stay dry. Believe it or not, just a slight bit of perspiration (sweat) can make you cold down to the bone and could lead to frostbite or hypothermia. Wear an under-layer of moisture-wicking material such as polypropylene, including a shirt, pants, socks, and mitten liners. This is better than cotton if you have a choice, but cotton can also be worn. Be aware that cotton may get wet and stay wet, so try to stay as dry as possible and wear layers. A good tip for staying dry is also to wear your boots or overshoes loosely tied until arriving at your site. If you get hot along the way, be sure to unzip your jacket to let out some of the heat or even take off a layer. You could also carry a few extra pairs of dry felt boot liners, moisture wicking socks, and mitten liners. Moisture or sweat can make you very cold when the wind begins to blow. The next layer is the warmth layer and wool is a great fabric for this. It keeps you warm when dry and damp! Fleece is also a popular warmth layer as well as down jackets. Wool is great for hats and mittens as long as they have a protective windbreaker fabric on the inside or outside. A face mask or neck warmer may be the ticket in windy weather. Also, be sure your hat has generous ear flaps to cover your entire ears if the wind gets a howlin'. A one-piece insulated coverall is ideal for this sport, especially if it has a hood that can be left open or pulled tight around the face and neck. The final layer is the windbreaker. Leather can protect against the wind, but it can stiffen and crack in extreme cold temperatures. Down jackets are nice since they often provide a windbreaking shell on the outside. If you choose to wear wool or fleece as a warmth layer, be sure and top it off with a rip-stop nylon windbreaker shell. The wind can cut through even the warmest wool sweater or jacket when you're out on the lake. Goggles tucked in a pocket can also help protect you against the blustery wind. Your feet take the most beating since they are on the ice and snow for hours at a time. Pack boots usually do the trick and offer several layers of insulation as well as a protective rubber layer to keep you dry. Avoid soft-sided hiking boots or street shoes that can get wet and let the wind through. Waterproof and well insulated winter boots are the best footwear for ice fishing. Ice shanties are small shelters which can help keep you out of the wind and blowing snow as you fish. Shanties are made of wood or plastic and can be rented from many sport fishing outlets or can be made at home. Typically, they are about 6 feet by 6 feet with a bench for two, and tall enough for you to stand. Portable canvas shelters also make for a protected area for fishing for long periods of time and they can be set up at a moments notice if the weather turns bad. Inside, some anglers use stoves and heaters to keep warm. Others use small burners outside on the ice to warm their hands or to keep them warm as they sit to fish. As always, use caution with any heater. Sometimes shanties can be left on the lake most of the winter and people group together in a "shanty town." Late in the season, portable shelters can be used but they must be removed daily. Be sure and check your current fishing regulations for ice shanty rules. Remember, moving around can help you keep warm. Bring your ice skates and glide around the ice while you watch your tip-ups. A well-insulated jug of hot chocolate or soup is always a great treat out on the ice and it will keep you energized to stay out if the fish are really biting. "Thick and blue, tried and true. Thin and crispy, way too risky." On a large lake you can lose your sense of direction if you get caught in the dark, or if the weather should turn nasty. Some anglers have a compass strapped right to their arm where it's visible or one in an accessible outside pocket. These anglers take a compass reading (bearing) of their intended route before leaving shore. If a blizzard or a "white out" should hit, they can follow their compass in the reverse direction to get back to shore quickly. It wouldn't hurt to take a bearing from your fishing hole back to a visible landmark as well. Careful planning begins with checking the weather report and getting back to safety before dark. Fishing Regulations - Bring a copy of the State Fishing Regulations pamphlet with you to consult during your fishing trip so that you are fishing within the state laws. Toboggan or sled - This is a practical way to haul equipment onto the ice. Some anglers put their gear on top of their shanty, which is transported on runners. Ice auger - This tool is for drilling your fishing hole in the ice. The hole should be no more than 12 inches across. Skimmer - This handy tool is needed to scoop out slush or chips from your fishing hole. It looks like a long-handled soup ladle, with a shallow, sieved bowl. Ice chisel - Called "spuds," ice chisels are used for chopping holes early in the ice fishing season when the ice is thinner. Be sure to secure these thin, but hefty, poles with a line tied to your arm. Many spuds have slipped from angler's grasp and plummeted to the bottom of a lake. Bait bucket - Holds live bait such as minnows. Gaff hook - A special-purpose, large and heavy hook to help hoist a slippery fish through a hole in the ice. Seat - Something to sit on such as a small stool or folding chair, sometimes even a 5-gallon bucket. Dip net - Used to dip into minnow buckets to retrieve bait and keep hands dry. Hook disgorger - A tool like a needlenose pliers to help you get the hook out of the fish's mouth. Jigging rod - Light and flexible rods used mostly for panfish (bluegills) and walleye. A short, firmer rod is better for perch. Tip-up - A clever device that signals when a fish hits on your line. A flag "tips up" when the fish strikes and gives you the freedom to leave the fishing hole for a moment. Hooks - Small number 10 or 12 hooks are recommended for panfish. Short shank number 3 hooks are good for walleye. Northern pike go for large number 2/0 to 6/0 hooks. Swedish hooks, also called pike hooks, are used for northern pike. Lures - Ice flies and teardrop lures with live bait are recommended for panfish. Jigs - Many types of fish can be caught on minnow imitation jigs. Line - Light monofilament (a thin plastic length of string), 2 to 4-pound test (breaking strength), is all you need for panfish. Game fish require at least 10-pound test. Leaders - A leader is a short wire that the hook is attached to. The fishing line is then tied to the other end of the leader. For walleye, take 2 or 3 monofilament leaders, at least 12-pound test (breaking strength) and about 3 feet long. For browns, northern pike or lake trout, 2 or 3 wire leaders, and about 15-pound test will do the job, but in most waters, 8-pound test should be enough. Fish can be recycled when you practice catch and release fishing. All fish below the legal minimum length limit must be released. Others that you don't want to keep can also be released. This type of recycling helps to keep the population and natural reproduction of a fish species at a high level in a lake and allows a fish the chance to grow to be an adult. Research shows that lakes need larger-sized fish to keep a balanced population. These strong, fast-growing fish have survived the early years when most fish die from natural causes. These fish are the primary spawners and major predators. A fish's body slows down a lot in the winter and reduces its need for oxygen. This helps make catch and release easy! Remember to handle the fish quickly and gently; do not squeeze the fish. Use a needlenose pliers to remove a lip hook. If the fish has swallowed the hook, cut the line and it will dissolve inside the fish in a short time. Ease the fish back into the water, don't throw it. Next time you catch that big one, you'll be glad you recycled others!